Unofficial Guide readers will recall the review of Snow White’s Scary Adventures, where we mentioned Ben, an autistic boy whose love of the attraction led him to ride thousands of times. Equally amazing were Ben’s parents, who not only had unlimited patience and love for Ben, but unlimited tolerance for Snow White. Ben’s dad, Ron Miles, said that they coped by re-imagining Disney’s rides with different effects. Their idea for a Stitch-based Tiki room is still the best I’ve heard for that attraction. Ben’s story is now out in book form. 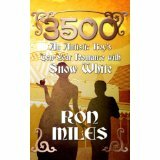 3500: An Autistic Boy’s Ten-Year Romance with Snow White, written by Ron, tells the story of raising a child with autism, finding Walt Disney World, and the amazing Cast Members who helped make Ben’s childhood a little bit better. It’s funny. It’s emotional. It reminds you that there are patient, good people all around the world (especially The World). Mostly, it reminded me of how lucky I am as a parent. Worth the price of the book alone is the story of Ben getting to be the last person ever to ride Snow White’s Scary Adventures, before it closed for the Fantasyland expansion. Get it today. Help Choose The Next TouringPlans.com Logo! What Happens During a Medical Emergency at Disney World? I just fixed the link in the blog post. It should take you to an Amazon.com page where you can purchase the book. Sorry about that error! will it be published in nook or kindle formats? Thank you for posting this! My son has autism and he, too, has a special relationship with Walt Disney World. I definitely want to read Ben’s story! I remember the blog about this well – very emotional and a great reminder of why we love Disney World. I’ll have to get this book. I too, remember the blog. I’m heading over to Amazon right now to purchase the Kindle version. I anticipate needing a box of tissues. Book is great! Thank you for writing it. It is available in the Kindle Owner’s Lending Library. Have just finished reading the book and loved it. It truly defines the Disney magic, Walt would have been proud of those CMs that made it so memorable for Ben and his family.